A story exposing the ownership of the secret offshore company 17 Black on Friday sparked calls for government resignations and police investigations. Local criminal investigators have been handed an intelligence report naming Electrogas power station director and businessman Yorgen Fenech as the owner of the company, a probe by Times of Malta and Reuters has revealed. The story, revealing which named the owner of the company named as the target client of similar companies owned by Minister Konrad Mizzi and chief of staff Keith Schembri, saw an almost unprecedented surge in online traffic on Times of Malta and spread like wildfire on social media. 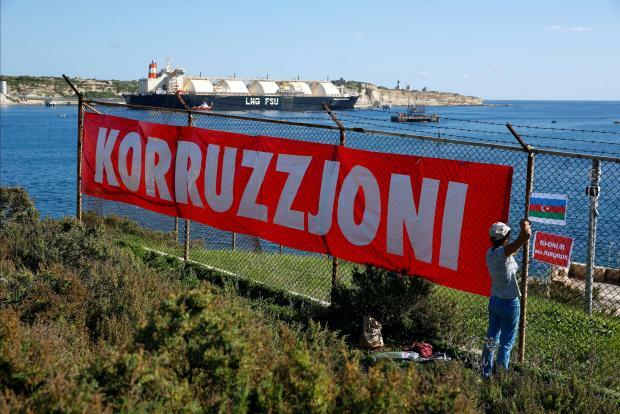 Reżistenza Malta, an activist group, were quick to erect a banner reading 'corruption' near the floating gas tanker, part of the power station project. They also left oil drums, wrapped in the Azeri flag and a slogan reading: "the truth will prevail". 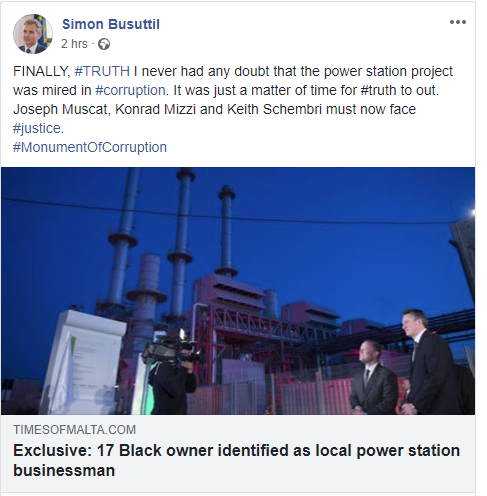 Former Opposition leader Simon Busuttil took to Facebook within minutes of the news breaking to say he never had any doubt that the power station project was “mired in corruption”. Nationalist Party MEP David Casa said that back in September he had called on 17 Black’s bank to cease its operations with the Dubai company. He said he had now written to the UAE Central Bank to ensure that the funds in 17 Black's frozen accounts were returned to Maltese tax payers. 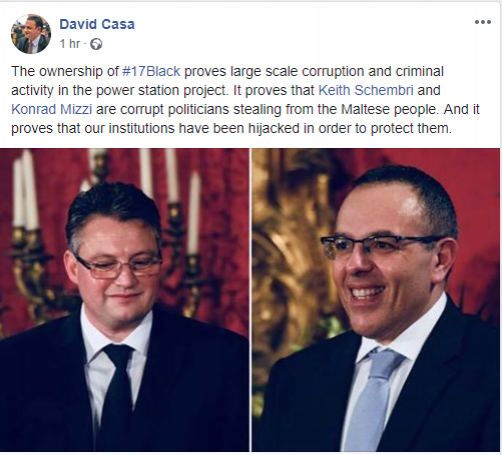 Mr Casa, who had been among the most vocal in the call for justice on the 17 Black reports, said the ownership revelation proved large scale corruption and criminal activity in the power station project. On Facebook, he wrote that Mr Schembri and Dr Mizzi were “corrupt politicians stealing from the Maltese people”. His sentiments were echoed by Nationalist MP Jason Azzopardi who called Prime Minister Joseph Muscat "corrupt" and challenged him to file libel proceedings. In a statement, the Democratic Party called for “an immediate and thorough” police investigation into the 17 Black allegations. “It has become undeniable that the rule of law in Malta has broken down despite the massive propaganda campaign by the government and its network of yes-men in key positions,” the party said. Activist group Occupy Justice was unequivocal in it’s reaction: “resign”. Will you be organising another #MassMeeting like last May to defend @keithaschembri @KonradMizzi? But not everyone was convinced of the story, with several Labour Party supporters saying that Mr Fenech's connection with 17 Black proved the company was not owned by either Mr Schembri or Dr Mizzi, as had been claimed by some in the past.